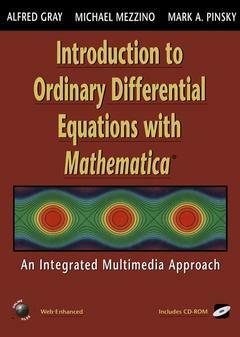 Introduction to ordinary differential equations with mathematica (w/ CD ROM) Gray Alfred, Mezzino Michael, Pinsky Mark A.
Auteurs : Gray Alfred, Mezzino Michael, Pinsky Mark A. Contents: Basic Concepts.- Using Mathematica.- First Order Differential Equations.- The Package ODE.m.- Existence and Uniquenesss of Solutions of First Order Differential Equations.- Applications of First Order Equations I.- Applications of First Order Equations II, 8) Second Order Linear Differential Equations.- Second Order Linear Differential Equations with Constant Coefficients.- Using ODE.m to Solve Second Order Linear Differential Equations.- Applications of Linear Second Order Equations.- Higher Order Linear Differential Equations.- Numerical Solutions of Differential Equations, 14) The Laplace Transform.Systems of Linear Differential Equations.- Phase Portraits of Systems.- Stability of Nonlinear Systems.- Applications of Linear Systems.- Applications of Nonlinear Systems.- Power Series Solutions of Second Order Equations.- Frobenius Solutions of Second Order Equations.- Appendices. 1. Basic Concepts.- 1.1 The Notion of a Differential Equation.- 1.2 Sources of Differential Equations.- 1.3 Solving Differential Equations.- 2. Using Mathematica.- 2.1 Getting Started with Mathematica Getting Started with Mathematica.- 2.2 Mathematica Notation versus Ordinary Mathematical Notation.- 2.3 Plotting in Mathematica.- 3. First-Order Differential Equations.- 3.1 Introduction to First-Order Equations.- 3.2 First-Order Linear Equations.- 3.3 Separable Equations.- 3.4 Exact Equations and Integrating Factors.- 3.5 Homogeneous First-Order Equations.- 3.6 Bernoulli Equations.- 4. The Package ODE • m.- 4.1 Getting Started with ODE.- 4.2 Features of ODE.- 4.3 Plotting with ODE.- 4.4 First-Order Linear Equations viaODE.- 4.5 Separable Equations via ODE.- 4.6 First-Order Equations with Integrating Factors via ODE.- 4.7 First-Order Homogeneous Equations viaODE.- 4.8 Bernoulli Equations via ODE.- 4.9 Clairaut and Lagrange Equations viaODE.- 4.10 Nonelementary Integrals.- 4.11 Using ODE to Define New Functions Ill.- 4.12 Riccati Equations.- 5. Existence and Uniqueness of Solutions of First-Order Differential Equations.- 5.1 The Existence and Uniqueness Theorem.- 5.2 Explosions and a Criterion for Global Existence.- 5.3 Picard Iteration.- 5.4 Proofs of Existence Theorems.- 5.5 Direction Fields and Differential Equations.- 5.6 Stability Analysis of Nonlinear First-Order Equations.- 6. Applications of First-Order Equations I.- 6.1 Population Models with Constant Growth Rate.- 6.2 Population Models with Variable Growth Rate.- 6.3 Logistic Model of Population Growth.- 6.4 Population Growth with Harvesting.- 6.5 Population Models for the United States.- 6.6 Temperature Equalization Models.- 7. Applications of First-Order Equations II.- 7.1 Application of First-Order Equations to Elementary Mechanics.- 7.2 Rocket Propulsion.- 7.3 Electrical Circuits.- 7.4 Mixing Problems.- 7.5 Pursuit Curves.- 8. Second-Order Linear Differential Equations.- 8.1 General Forms and Examples.- 8.2 Existence and Uniqueness Theory.- 8.3 Fundamental Sets of Solutions to the Homogeneous Equation.- 8.4 TheWronskian 2.- 8.5 Linear Independence and the Wronskian.- 8.6 Reduction of Order.- 8.7 Equations with Given Solutions.- 9. Second-Order Linear Differential Equations with Constant Coefficients.- 9.1 Constant-Coefficient Second-Order Homogeneous Equations.- 9.2 Complex Constant-Coefficient Second-Order Homogeneous Equations.- 9.3 The Method of Undetermined Coefficients.- 9.4 The Method of Variation of Parameters.- 10. Using ODE to Solve Second-Order Linear Differential Equations.- 10.1 Using ODE to Solve Second-Order Constant-Coefficient Equations.- 10.2 Details of ODE for Second-Order Constant-Coefficient Equations.- 10.3 Reduction of Order and Trial Solutions via ODE.- 10.4 Equations with Given Solutions via ODE.- 11. Applications of Linear Second-Order Equations 325.- 11.1 Mass-Spring Systems.- 11.2 Forced Vibrations of Mass-Spring Systems.- 11.3 Electrical Circuits.- 11.4 Sound.- 12. Higher-Order Linear Differential Equations.- 12.1 General Forms.- 12.2 Constant-Coefficient Higher-Order Homogeneous Equations.- 12.3 Variation of Parameters for Higher-Order Equations.- 12.4 Higher-Order Differential Equations via ODE.- 12.5 Seminumerical Solutions of Higher-Order Constant-Coefficient Equations.- 13. Numerical Solutions of Differential Equations.- 13.1 The Euler Method.- 13.2 The Heun Method.- 13.3 The Runge-Kutta Method.- 13.4 Solving Differential Equations Numerically with ODE.- 13.5 ODE’s Implementation of Numerical Methods.- 13.6 Using NDSolve.- 13.7 Adaptive Step Size and Error Control.- 13.8 The Numerov Method.- 14. The Laplace Transform.- 14.1 Definition and Properties of the Laplace Transform.- 14.2 Piecewise Continuous Functions.- 14.3 Using the Laplace Transform to Solve Initial Value Problems.- 14.4 The Gamma Function.- 14.5 Computation of Laplace Transforms.- 14.6 Step Functions.- 14.7 Second-Order Equations with Piecewise Continuous.- Forcing Functions.- 14.8 Impulse Functions.- 14.9 Convolution.- 14.10 Laplace Transforms via ODE.- 15. Systems of Linear Differential Equations.- 15.1 Notation and Definitions for Systems.- 15.2 Existence and Uniqueness Theorems for Systems.- 15.3 Solution of Upper Triangular Systems by Elimination.- 15.4 Homogeneous Linear Systems.- 15.5 Constant-Coefficient Homogeneous Systems.- 15.6 The Method of Undetermined Coefficients for Systems.- 15.7 The Method of Variation of Parameters for Systems.- 15.8 Solving Systems Using the Laplace Transform.- 16. Phase Portraits of Linear Systems.- 16.1 Phase Portraits of Two-Dimensional Linear Systems.- 16.2 Using ODE to Solve Linear Systems.- 16.3 Phase Portraits of Two-Dimensional Linear Systems via ODE.- 17. Stability of Nonlinear Systems.- 17.1 Curves.- 17.2 Autonomous Systems.- 17.3 Critical Points of Systems of Differential Equations.- 17.4 Stability and Asymptotic Stability of Nonlinear Systems.- 17.5 Stability by Linearized Approximation.- 17.6 Lyapunov Stability Theory.- 18. Applications of Linear Systems.- 18.1 Coupled Systems of Oscillators.- 18.2 Electrical Circuits.- 18.3 Markov Chains.- 19. Applications of Nonlinear Systems.- 19.1 Numerical Solutions of Systems of Differential Equations.- 19.2 Predator-Prey Modeling.- 19.3 The Van Der Pol Equation.- 19.4 The Simple Pendulum.- 19.5 The Fundamental Theorem of Plane Curves.- 20 Power Series Solutions of Second-Order Equations.- 20.1 Review of Power Series.- 20.2 Power Series via >Mathematica.- 20.3 Power Series Solutions about an Ordinary Point.- 20.4 The Airy Equation.- 20.5 The Legendre Equation.- 20.6 Convergence of Series Solutions.- 20.7 Series Solutions of Differential Equations Using ODE.- 21. Frobenius Solutions of Second-Order Equations.- 21.1 Solutions about a Regular Singular Point.- 21.2 The Cauchy-Euler Equation.- 21.3 Method of Frobenius: The First Solution.- 21.4 Bessel Functions I.- 21.5 Method of Frobenius: The Second Solution.- 21.6 Bessel Functions II.- 21.7 Bessel Functions via >Mathematica.- 21.8 An Aging Spring.- 21.9 The Hypergeometric Equation.- A. Appendix: Review of Linear Algebra and Matrix Theory.- A.l Vector and Matrix Notation.- A.2 Determinants and Inverses.- A.3 Systems of Linear Equations and Determinants.- A.4 Eigenvalues and Eigenvectors.- A.5 The Exponential of a Matrix.- A.6 Abstract Vector Spaces.- A.7 Vectors and Matrices with Mathematica.- A.8 Solving Equations with Mathematica.- A.9 Eigenvalues and Eigenvectors with Mathematica.- B. Appendix: Systems of Units.- Answers.- General Index.- Name Index.